This view by Edward Bennett leaning way out from the parapet of the Railway Exchange Building rooftop, shows Michigan Avenue looking south, and at the south end of the future Grant Park, at Twelfth Street (later Cermak Road), the Illinois Central Railroad Terminal (1893, designed by architect Bradford L. Gilbert; closed 1972 and demolished 1974). The occasion is an event with a parade of marching men, 1909 - 1910 or before the landfill project for the future Field Museum south of Grant Park had begun. This photo shows a Michigan Avenue, Chicago, parade, ca. 1909-12, from the vantage point of the planning office (1906-09, Plan of Chicago; after 1910 Bennett's office), 18th fl. suite of the Railway Exchange Building, and above the Burnham firm offices there. It is one of perhaps dozens from ca. 1909 to ca. 1920 showing the evolution of the Grant Park space. Soon after the plan was issued in 1909 by the Commercial Club, legal objections were raised to Burnham's desire to place three large museum structures in the park, supposed to be forever free of buildings. After Burnham's 1912 death, Bennett was left to craft a completely new plan for Grant Park, one where he went back to 17th C. French garden style precedents. A letter at Berkeley's library from Bennett, found by Joshua Anderson '10, makes this point. One of the museums proposed, for anthropology and related exhibits from the 1893 World's Fair, was built but on landfill from the 1910s south of Grant Park. This view shows the park prior to the implementation of any of Bennett's plans. 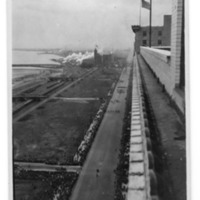 Later, this view would show the eastern terminus to Congress Street and leading east across the tracks to the future (1920s) Buckingham Fountain, a doubled in size version of the Fountain of Latona, as well as the landfill to the south and the new classic style Field Museum, opened in 1920. A word about the vantage point for the photograph is worth adding. Bennett as a lad had sailed on his father's clipper ship Theseus around Cape Horn from Bristol, England to San Francisco on some occasions, later 1880s. Very likely he was used to climbing in the swaying rigging. Many of Bennett's photographs show a lack of fear of heights on his part, perhaps as a result. Bennett, Edward H. (Edward Herbert), 1874-1954, “Michigan Avenue, aerial view, looking south to future Grant Park site,” Digital Collections - Lake Forest College, accessed April 26, 2019, http://collections.lakeforest.edu/items/show/1905.